Swoon. Boots by Tim Alden. Hey, how are you? It's been a while since we visited. My life's been busy. How about yours? You shouldn't feel too guilty about Christmas. Listen, I'm decidedly behind on my shopping. I'm not much of a shopper anyway. I've trained myself to want something, think about buying it, decide I don't like it after I've brought it home, then never go out and buy it in the first place. Easy on the credit cards and my bank account. Except, I can't talk myself out of those pair of custom leather boots. I'm still salivating for them. As for Christmas gifts, I lean toward books and handicrafts. The house has gone to piss lately (I did put up the tree) because I gave myself a big end-of-year gift. I allowed myself the time to finish writing my second Musketeer novel, furthering my obsession with Athos. I just finished the story of how he originally meets Milady and falls in love with her, only to watch his world crumble. To be a novelist, you must have a few obsessions (or a bankroll that won't quit) to see a book to its end. Novels are tentacles and steam coming out of a hot pot. Hard to wrestle and contain. Tangents can be killers. Rogue characters can sabatoge a good story line. Endings must have a climax and an explanation. Loose ends need knots. My ending flowed out of me. The last one did, too. I'd been imagining The End for a month or two, in my march toward it. I've been repeating, I'm almost finished. 50 more pages. Then after I'd written a few more chapters, I still said 50 more pages. Then I wrote a few more chapters, and I decided: keep going. So a week ago, I just let 'er rip. I wrote 30 pages in a week. On Sunday night at about 10:30, I typed the six letters as satisfying as I love you: THE END. Those phrases look wrong next to each other, but they do go together. I do love my draft. If you don't love a draft, that's a sad state of affairs. I think you must be in love with your draft because otherwise you'd throw it away and think you should seek intense in-patient therapy. Face it, there's no rational reason to write a book, or write a song, or create a painting or throw a pot. Few people start out being creative for the money. It's an expression of who you are. It's not perfect, never will be. My infatuation with my draft will last until the first round of readers gives me input. I'll sulk and mope about making changes. Then, I'll get over myself and make them. The novel turns out even better afterward, and I'll love it again. Then, I'll start another one, which I already have. 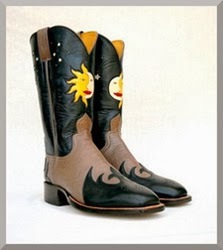 See more boots by Tim Alden, who in no way persuaded me to include him in this post. He's just a friend. So it's true, that sometimes writers' characters take control of the story and you're running behind, trying to catch up! They can chatter in your head incessantly. Until the book is finally finished, then we all rest. Hey! How's the feedback on your release. Inquiring minds want to know.